Home > Law Books > Lawyering Skills > Jurywork: Systematic Techniques, 2d, 2018-2019 ed. Jurywork: Systematic Techniques, 2d, 2018-2019 ed. 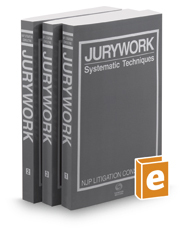 Jurywork: Systematic Techniques provides the latest thinking, expert advice, methods, and strategies for effectively handling civil or criminal jury trials. The guide synthesizes law, sociology, and psychology to help improve jury selection and communication with jurors. It includes insight into trial preparation, case analysis, juror attitudes, and voir dire questions and procedures.